Whenever Index looks out of the window on a rainy day, she will forever remember each and every raindrop she sees. The gift of perfect memorization defined her entire life under the care of the Church of England. Index willingly became the container of 103,000 grimoires, accepting the combined weight of all the forbidden arts her Church had faced in its history. Her sacrifice notwithstanding, she inevitably became the most dangerous person for her own patrons. Constantly fearing betrayal or having its secrets exposed, the Church of England kept a close watch on Index and controlled all her movements. It was also decided that her personal memories were to be regularly erased. Index led the life of a vagabond, unaware of her own situation and importance. Under constant supervision, she journeyed and met new people, only to have her memories of them snatched away from her and her entire life reset every year. Her nearly boundless knowledge of magic does not translate to everyday life know-how – she constantly has to rediscover all the experiences she is robbed of, which sometimes leads to troublesome misunderstandings. 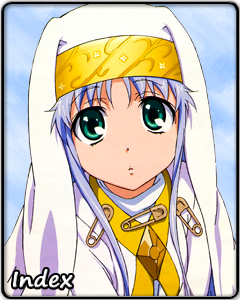 Despite this, Index retains her bright, if slightly childish, personality. For a nun, she is not particularly resistant to temptation, especially when it comes to food. Another quality of hers that remains unchanged is her willingness to help and protect others, even at her own cost.